My Mum turns 70 in May. I have written about her before and how she inspires me every day. She raised five children (I may be biased about my siblings but I believe them to be some of the world’s best humans). She also fostered three children after we had grown up and showed them a way of being that they had never experienced before. In the very final stretch of her 60s she is taking on perhaps her biggest life challenge. This month she is climbing Mount Kilimanjaro, the highest mountain in Africa, over 19,000 feet above sea level. My youngest sister, her fiancee and his Mum are doing the climb too. If I wasn’t busy growing a new business and looking after three young children I would be right there by her side. Mum is fit and healthy only because she never sits still. She has never done any formal exercise that I can think of, so starting at this point in her life is no mean feat. She has trained and prepared, which has not been free from worry. She successfully climbed Snowdon in Wales, and fell at the very bottom. She sliced her head open and had 14 stitches. That might have stopped some almost 70-year-olds. But not her! For her it was a temporary set-back. She rested and then got back up. Back to her personal training, back to her rigorous walks up the local hill. She continues to advance. I know she is nervous but she is climbing her wall of worry. It’s not that I want to liken the stock markets to my Mum but climbing a wall of worry is exactly what they do. 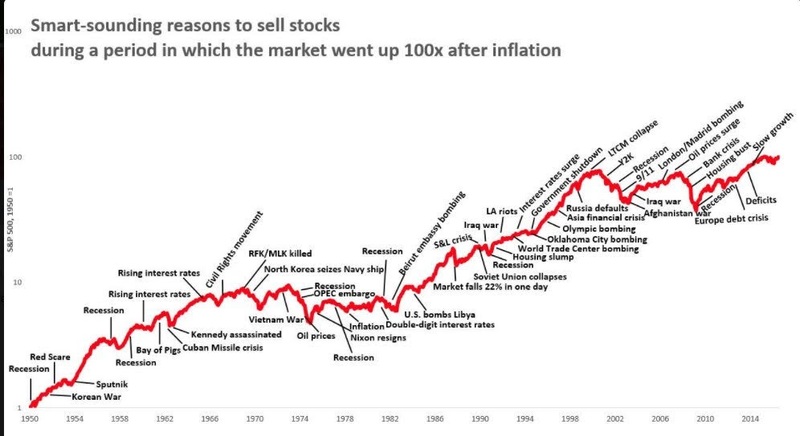 Markets are always climbing a wall of worry – just look at the chart below. There has never been a permanent impediment to the market’s advance. My Mum could have found a million reasons not to climb a giant mountain in the middle of Africa. The memory of her fall would be enough for most people. Markets are resilient because we humans are resilient. Just like my 70-year-old Mum taking on Mount Kilimanjaro, the markets take on all the ‘crisis’ events. Sometimes they are set-back and fall, but the permanent advance always continues. Just like climbing a mountain, investing in stocks will always be a bit worrisome because of its uncertainty. The role of a good advisor is to reduce the worry as much as possible. The thing to remember is that it’s the uncertainty that gives us a return. If you want the view from the top of the mountain, you have to climb it. Cash is comfortable, so is sitting at the bottom of the mountain. If you want to read a bit about my Mum’s charity story, click here.